This report is from G.W. Angus, Division Communication Superintendent, Alameda, California. 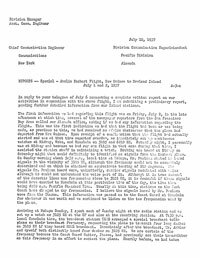 In reply to your telegram of July 6 requesting a complete written report on our activities in connection with the above flight, I am submitting a preliminary report, pending further detailed information from our Island stations. 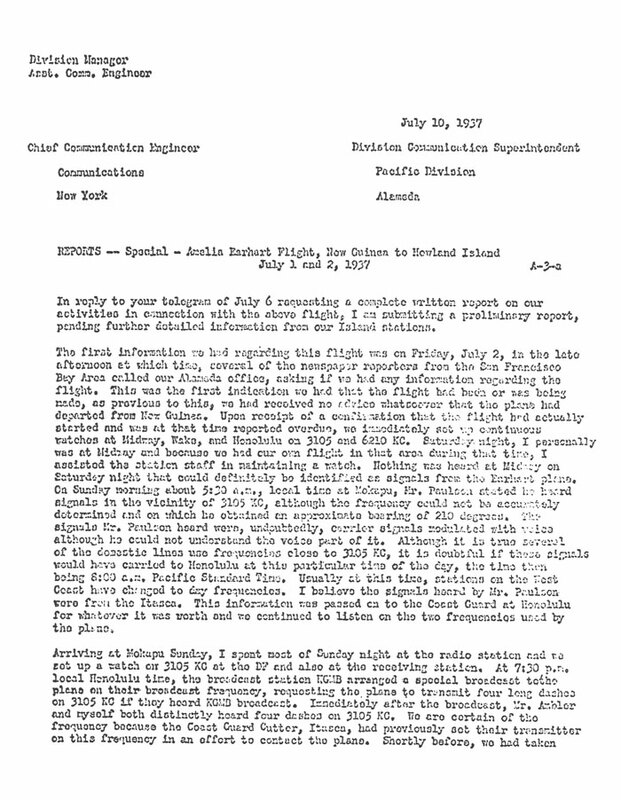 The first information we had regarding this flight was on Friday, July 2, in the late afternoon at which time, several of the newspaper reporters from the Sand Francisco Bay Area called our Alameda office, asking if we had any information regarding the flight. This was the first indication we had that the flight had been or was being made, as previous to this, we had received no advice whatsoever that the plane had departed from New Guinea. Upon receipt of a confirmation that the flight had actually started and was at that time reported overdue, we immediately set up continuous watches at Midway, Wake and Honolulu on 3105 and 6210 KC. Saturday night, I personally was at Midway and because we had our own flight in that area during that time, I assisted the station staff in maintaining a watch. 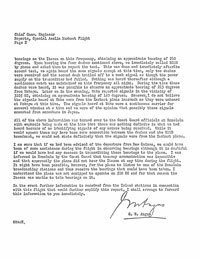 Nothing was heard at Midway on Saturday night that could definitely be identified as signals from the Earhart plane. 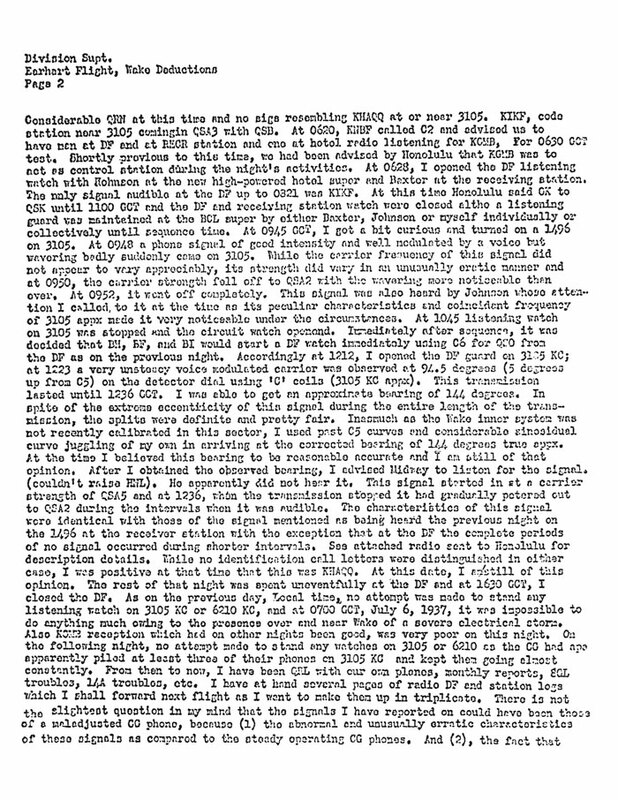 On Sunday morning about 5:30 a.m., local time at Mokapu, Mr. Paulson stated he heard signals in the vicinity of 3105 KC, although the frequency could not be accurately determined and on which he obtained an approximate bearing of 210 degrees. The signals Mr. Paulson heard were, undoubtedly, carrier signals modulated with voice although he could not understand the voice part of it. 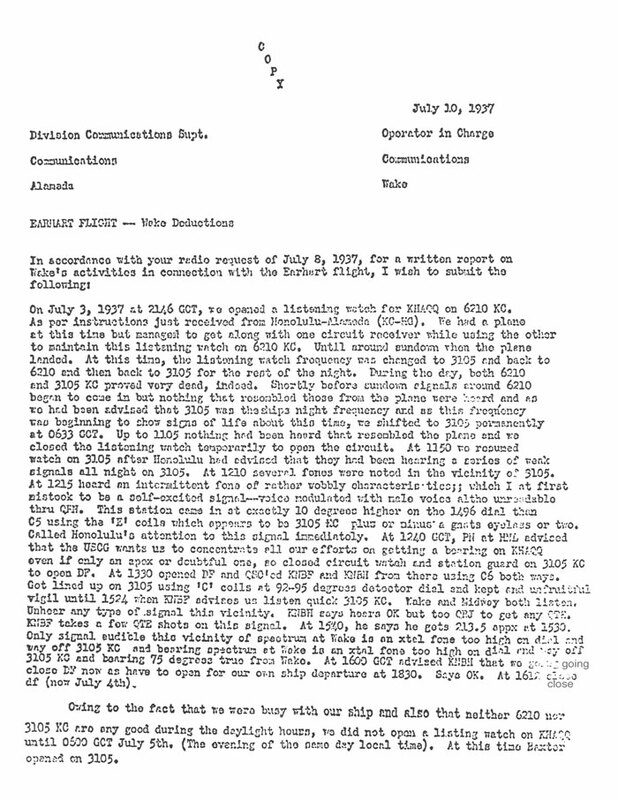 Although it is true several of the domestic lines use frequencies close to 3105 KC, it is doubtful if these signals would have carried to Honolulu at this particular time of the day, the time then being 8:00 a.m. Pacific Standard Time. Usually at this time, stations on the West Coast have changed to day frequencies. I believe the signals heard by Mr. Paulson were from the Itasca. This information was passed on to the Coast Guard at Honolulu for whatever it was worth and we continued to listen on the two frequencies used by the plane. bearings on the Itasca on this frequency, obtaining an approximate bearing of 210 degrees. Upon hearing the four dashes mentioned above, we immediately called KGMB by phone and asked them to repeat the test. This was done and immediately after the second test, we again heard the same signals except at this time, only two dashes were received and the second dash trailed off to a weak signal as though the power supply on the transmitter had failed. Nothing was heard thereafter although a continuous watch was maintained on this frequency all night. During the time these dashes were heard, it was possible to observe an approximate bearing of 213 degrees from Mokapu. Later on in the evening, Wake reported signals in the vicinity of 3105 KC, obtaining an approximate bearing of 140 degrees. However, I do not believe the signals heard at Wake were from the Earhart plane inasmuch as they were unheard at Mokapu at this time. The signals heard at Wake were a continuous carrier for several minutes at a time and we were of the opinion that possibly these signals emanated from somewhere in Japan. All of the above information was turned over to the Coast Guard officials at Honolulu with emphasis being made at the time that there was nothing definite in what we had heard because of no identifying signals of any nature being received. 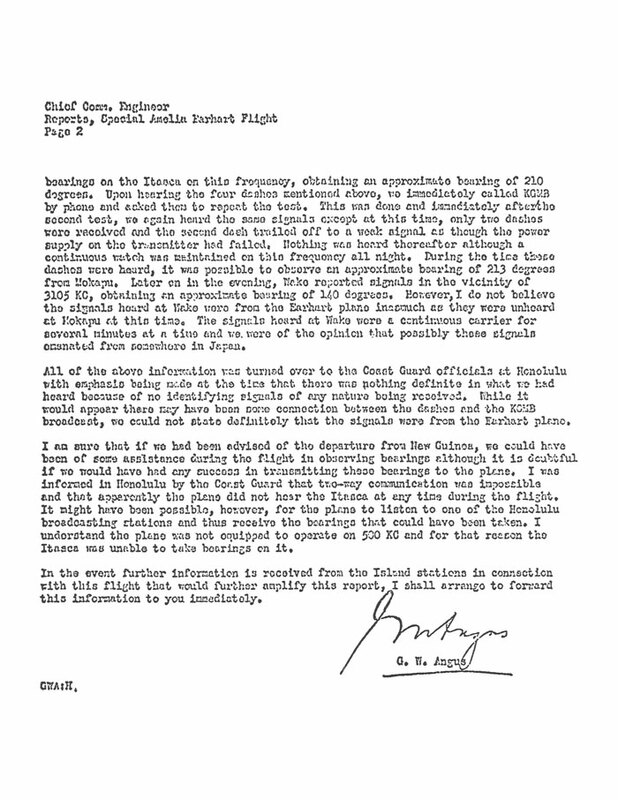 While it would appear there may have been some connection between the dashes and the KGMB broadcast, we could not state definitely that the signals were from the Earhart plane. I am sure that if we had been advised of the departure from New Guinea, we could have been of some assistance during the flight in observing bearings although it is doubtful if we would have had any success in transmitting these bearings to the plane. I was informed in Honolulu by the Coast Guard that two-way communication was impossible and that apparently the plane did not hear the Itasca at any time during the flight. It might have been possible, however, for the plane to listen to one of the Honolulu broadcasting stations and thus receive the bearings that could have been taken. I understand the plane was not equipped to operate on 500 KC and for that reason the Itasca was unable to take bearings on it. In the event further information is received from the Island stations in connection with this flight that would further amplify this report, I shall arrange to forward this information to you immediately.